eBay find. The seller said It came from Hollywood Blvd. 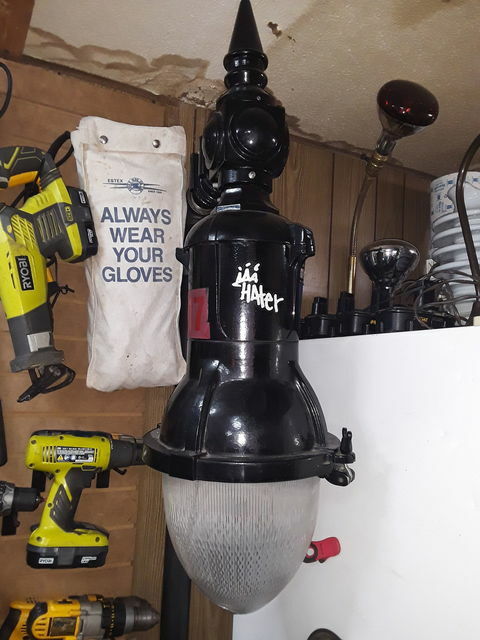 Jan 06, 2019 at 12:41 PM Author: Cole D.
Is this a reproduction or an original that's been retrofitted to metal halide? It's a reproduction. It's factory made for metal halide. It seems to have a crack on the glass globe, does not it? Would it have a replacement from the seller? It does have a crack in it. I threw some gorilla glue on it and it's holding. I did get another one from the seller and have it safely put away. I just using the cracked one now so if it breaks to the point that glue no longer works I have a new one. Does the seller have more available? I kind of want one.